Occipital, purveyor of fine iPhone wares such as Redlaser and ClearCam, recently released a new iPhone app 360 Panorama. And in the process, they discovered you can navigate pages in Mobile Safari using the iPhone 4's gyroscope. Occipital goes as far to call this functionality augmented reality, but that's a bit of an exaggeration. However, they were nice enough to create an interactive demo for us all to use, showing off the functionality stowed away in the Mobile Safari (you need an iPhone 4 or a 4G iPod touch with iOS 4.2 installed). 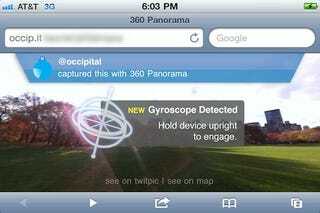 Basically, you can create an image using Occipital's 360 Panorama app, and then upload the photo to their site. When you load the page in Mobile Safari, the browser will auto-detect the gyroscope and pan through the image as you turn your phone/body.